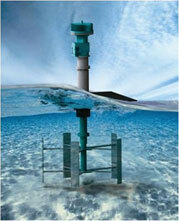 Recent innovations are driving new interest in an old technology – hydrokinetic power. Systems use the kinetic energy, or velocity head, of a flow by placing the turbine in a river or canal. Hydrokinetic power differs from conventional hydropower, which uses the potential energy or pressure head of the water to generate energy. Hydrokinetic systems require relatively high flow velocities and sufficient water depth to maintain submergence of the turbine. The potential to extract energy from the flow is related to the swept area of the turbine and the velocity cubed, much like a wind turbine. Hydrokinetic systems can only extract a fraction of the power from the water compared to conventional hydropower systems; hydrokinetic turbines are based on the kinetic energy of the flow only and not the potential energy from pressure head. The majority of hydrokinetic turbines are still in the prototype phase, with a small number of companies offering commercial products. 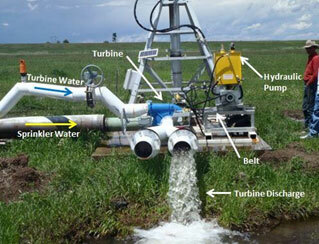 Commercial hydrokinetic turbines range in size from 5 kW to 250 kW and cost around $4,000 per installed kW. Compared to other forms of hydropower generation, hydrokinetic turbines are relatively expensive. Typically, conventional hydropower systems cost around $2,000 per installed kW. 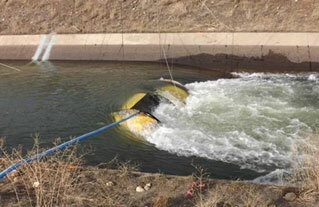 Hydrokinetic systems often appear simple to deploy, but low production relative to installed cost leads to a less cost-effective system than many conventional hydropower installations. Environmental issues can still impact the feasibility of hydrokinetic systems and can include impacts to aquatic life, erosion, and flow alteration.